REALITY #14: WARBURG’S PROOF: THE DATA POINTS TO MITOCHONDRIAL GENOME? THE TAKE HOME: The Warburg redox shift is well known but what causes it is not understood. What happens at Krebs bicycle, where the TCA and urea cycle meet in the matrix. The growth of cancer cells is initiated by a relative lack of oxygen but cancer cells need hyperoxia to grow to immortality. This initial change comes before cancer manifests and this destroys mitophagy initially. 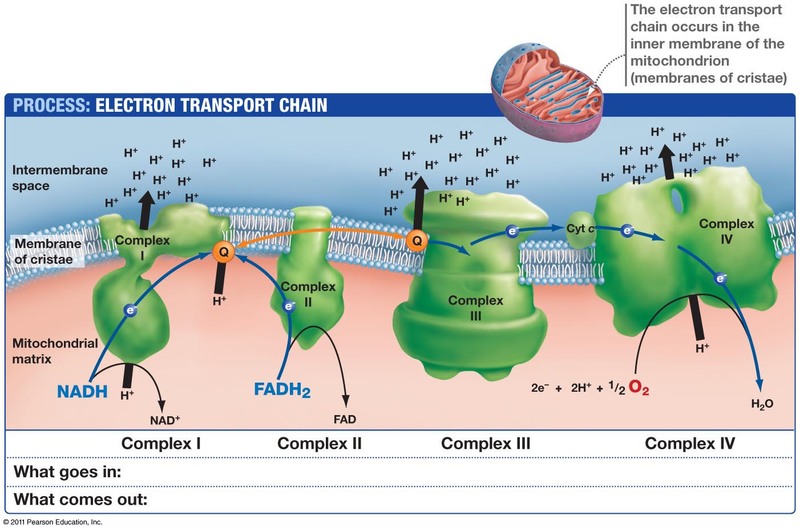 Once the cell adapts to a chronic pseudohypoxic state the matrix undergoes a deeper shift where the TCA and urea cycles cannot be used well because of proton alterations at Kreb’s bicycle. This forces the cell has to rely on glycolysis and the PPP because of a kinetic isotope effect (KIE) at Kreb’s bicycle. The chronic pseudohypoxia causes a nonlinear release of angiogenic factors into the arterial circulation to increase oxygen delivery from the blood cells to the cell and this favors the two older metabolic pathways glycolysis and the pentose phosphate pathway (PPP) for biosynthesis. Those two pathways are designed to work with low oxygen tensions that develop normally in certain cell lines. As a result of these proton effects, oncogenesis occurs when oxygen tensions are changing and become artificially high. Along with a previous loss of autophagy/mitophagy, the ongoing circadian mismatches a human faces, this eventually causes a complete inactivation of apoptosis. The retina, RBC, and embryonic stem cells all use the Warburg shift in a non-pathologic way to operate normally with sunlight. The pathologic Warburg shift occurs when both autophagy and apoptosis are inactivated. Warburg was the first to find out that cancer cannot live in an oxygen-poor environment. Blue light causes the extinction of both autophagy/apoptosis as blue light exposure continues via your eyes and skin. 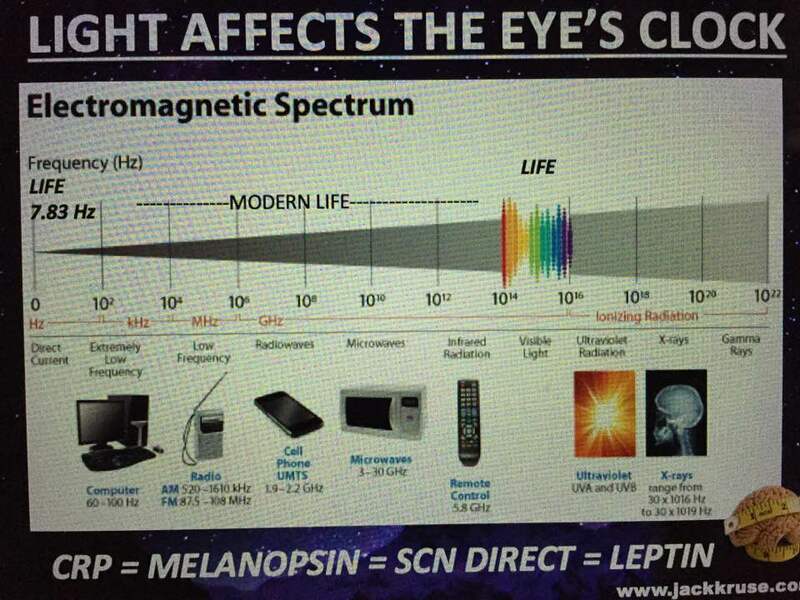 Blue light links to all opsins in humans. They are located in the eyes and skin. All opsins are linked to retinol which is vitamin A. When artificial blue light is prominent the retinol disassociates from the opsin and the opsin and DHA complex is no longer functional. 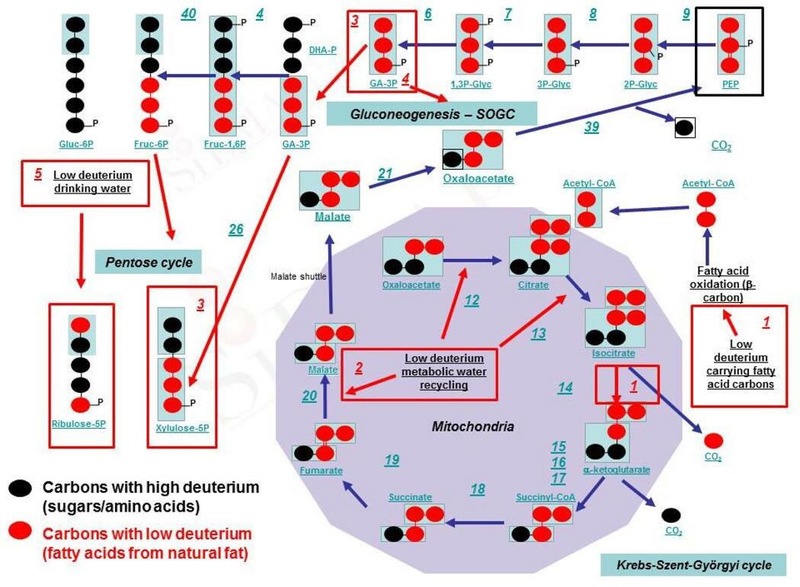 This lowers Vitamin A recycling in any tissue of neuroectodermal origin, DHA recycling (Bazan effect), and proton recycling in the TCA/urea cycle via Kreb’s bicycle. This is what causes the breakdown in the circadian mechanism. As Vitamin A cycle becomes extinguished by the chronicity of the blue light, its thermodynamic coupler, Vitamin sulfated D3 also drops in kind. This mimics the example I have often given about the relationship between predator and prey. Whatever is done to one side eventually occurs to the other side.We’ll discuss where the defect really lies in this mitochondrial disease. To get rid of cancer you must regain control of autophagy and apoptosis. When you lose control of both you get cancer. Sunlight allows you to recapture your rapture of both self-regulation programs mitochondria utilize in life. It is that simple. Metabolism is the process by which cells convert relatively simple extracellular nutrients into energy and building blocks necessary for their growth and survival. In cancer cells, metabolism is dramatically altered compared with normal cells. These alterations are known as the Warburg effect. One consequence of these changes is a cellular addiction to glutamine during this redox shift in mitochondria. In 1924, German biochemist Otto Warburg who observed that cancer cells undergo a high rate of glycolysis and lactic acid fermentation, even under normoxic conditions. One interesting facet, from a chemo-therapeutic point of view, is that, in a large number of cases, cells undergoing a Warburg effect exhibit a marked dependence upon glutamine and glucose, to the extent that these cells are referred to as being ‘glutamine or glucose addicted’. Glucose catabolism is not specific enough to tells us more about the source of this redox shift Warburg found, but it appears glutamine is very specific, and it points the finger of causation of aging and neolithic diseases at mitochondrial heteroplasmy rates. How so? Glutamine addiction arises from the need for extracellular glutamine to be consumed for anaplerotic input in the citric acid cycle, which accounts for the majority of the bioenergetic needs of normal (nontransformed) cells. The key gatekeeper of this input is the enzyme glutaminase. The functions of glutamine are many and include: substrate for protein synthesis, anabolic precursor for muscle growth, acid-base balance in the kidney, substrate for ureogenesis in the liver, substrate for hepatic and renal gluconeogenesis, an oxidative fuel for intestine and cells of the immune system, inter-organ nitrogen transport, precursor for neurotransmitter synthesis, precursor for nucleotide and nucleic acid synthesis and precursor for glutathione production. Many of these functions are connected to the formation of glutamate from glutamine. The primary function of the glutaminase enzymes is to catalyze the hydrolysis of l-glutamine to l-glutamate, the latter being generally unable to enter the mitochondria directly. As l-glutamate is formed it is converted to α-ketoglutarate by the enzyme glutamate dehydrogenase (GDH). This enzyme is controlled by calcium as a secondary messenger controller. HYPERLINK . This product can then be utilized directly in the citric acid cycle, leading to energy and building block production. Non-native electromagnetic fields are well-known disruptors of calcium control and calcium-gated channels to alter what can enter or exit a mitochondrion. This implies we do not have to have an ionizing form of radiation of nuclear DNA to get the oncogenic transformation. It implies that a change in energy and information variance from mitochondria in the AMPk pathways may be the key signal in a Warburg redox shift. This shift is always seen with abnormal free radical generation and the cell releases MORE ELF-UV light than normal. Most of the science world thinks that for radiation to cause a biologic effect they think it has to ionize DNA or RNA because they think change occurs from inside out in a cell. The reality of epigenetic science tells us it is exactly the opposite; The incident EMF is the key: outside in is the key mitochondrial effect in turning on genes more than we would like. This is why ubiquitin marking and a relative pseudohypoxia are both elevated in most chronic disease states. Remember that cancer is a CHRONICALLY “turned on” version of growth that is uncontrolled because circadian light cycles are decoupled from ubiquitin cycling. How so? The first step of the pentose pathway (PPP) is the irreversible committed step. This reaction is catalyzed by glucose-6-phosphate dehydrogenase. This step is allosterically regulated by light. The product of this reaction NADPH is a strong inhibitor. So when the cytosol concentration of NADPH is high, the enzyme’s activity is low. It is also allosterically regulated by fatty acid acyl esters of coenzyme A which is also controlled by light because hormones regulate the process. Those hormones are made by light signals as shown below. The transcription of the gene for this enzyme is under hormonal regulation. All pituitary hormones are controlled by dopamine levels initiated in the eye and under circadian control. All mitochondria are on circadian cycles tied to light and dark. Melatonin (the hormone that controls mtDNA) and dopamine (controls pituitary hormone release) are made from IR-A and UV-A morning light in the eye first. This also disrupts the Vitamin A cycle in the eye because every human photoreceptor is bound to an opsin. The hormonal control comes from the pituitary gland who hormones are released by AM light frequencies of sunlight (ruined by man-made light), which is anatomically located next to the median eminence of the brain, which links to the “analog circadian system” to environmental signals coded for by the water found in CSF. The median eminence has no blood-brain barrier and is bathed in CSF. What ultimately controls this regulation? 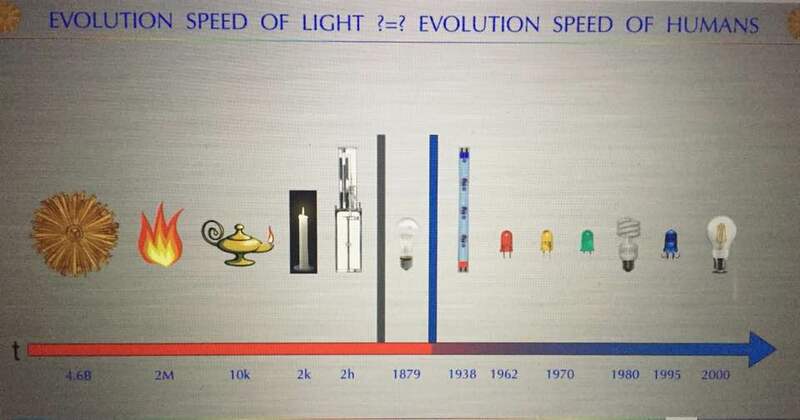 The EMF (light) found in the environment of DNA at this time controls it. If the CSF surrounding this area is electron dense or not, this is what ultimately determines if the DNA/RNA of the cells making our hormones are paramagnetic or not? Yes. Light only interacts with electrons photoelectrically. Whatever electrifies DNA/RNA controls its epigenetic expression. Mitochondrial redox levels control the light released in the system (bio-photon field). Popp showed in Warburg redox shifted cells, ELF-UV light is released to an excess. The higher the mitochondrial redox is the more quiet DNA/RNA expression is. The less energy flux through mitochondria the more active the genome becomes. The key to building the mitochondrial redox is sunlight exposure and light assimilation by the cell. Making any connections to nature yet, folks? You can become a fat burner just using AM solar exposure by using the PPP because this will limit excessive ROS mitochondrial leak, optimize the 100 Hz oscillation, while down-regulating the AMPk pathways when sunlight is the dominant EMF your cells experience. 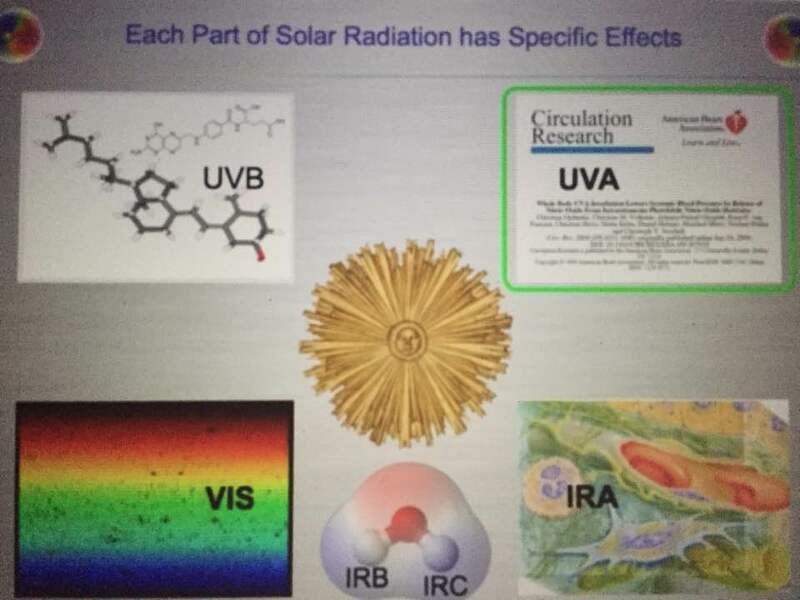 IR-A and UV-A light as the incident EMF allows for proper AMPk control and free radical signaling. Blue light from man-made devices is a different incident electromagnetic wave that causes a relative lack of oxygen and altered free radical signaling in cells. We seem to know that Xrays, another incident EMF, can cause cancer but we seem oblivious that blue light has the same potential despite is lower power density. The reason is that blue light increases a higher heteroplasmy rate and this lowers oxygen tensions in a cell. If you look at the picture of melatonin creation above you’ll see that a lower level of melatonin is also associated with higher heteroplasmy. It is well established in the literature that blue light destroys melatonin level. So ask yourself why no one is linking artificial blue light to cancer? It appears the incident electromagnetic wave is the trigger stimulus to the redox shift in mitochondria because of the ROS response made in mitochondria and the relative pseudohypoxia it causes. This energy flow from mitochondria and changes the biochemical response in cells. This is how seasonal light changes alter mitochondrial energy flows with a changing EMF back round from the sun’s natural cycles. Man’s cells have never been optimized for an alien light source that we created in 1879. When your environment is littered with man-made nnEMF waves this is impossible because AMPk pathways are turned on not off simulating the Warburg redox shift in mitochondria. Nora Volkow 2011 paper proves that. Allen Frey proved it before her. We, in science and medicine, keep ignoring it. This is where the Warburg shift comes from. Our colony of mitochondria is optimized for solar light EMF, not man-made nnEMF’s. With excessive EMF fields found in our modern environment, one loses the ability burn fat well unconsciously, regardless of the food you eat, because our five senses were not evolved to sense when the field effect moves from a waveform micropulsation event to a particle based field event. People forget that all light waves are transformed to electro-mechanical waveforms in a cell. Your sixth sense is based on your mitochondria because mitochondria are designed to respond to oscillations it receives from the cell membrane and cytosolic water it creates. These micropulsations are measured by the mitochondrial respiratory proteins and the distance between them is linked to the incident EMF the system senses. The amount of natural solar EMF and non-native EMF in the environment adjusts the sizes and shape of its own respiratory proteins and the distances between them to signal to the nuclear genome whether it should react or remain quiet. 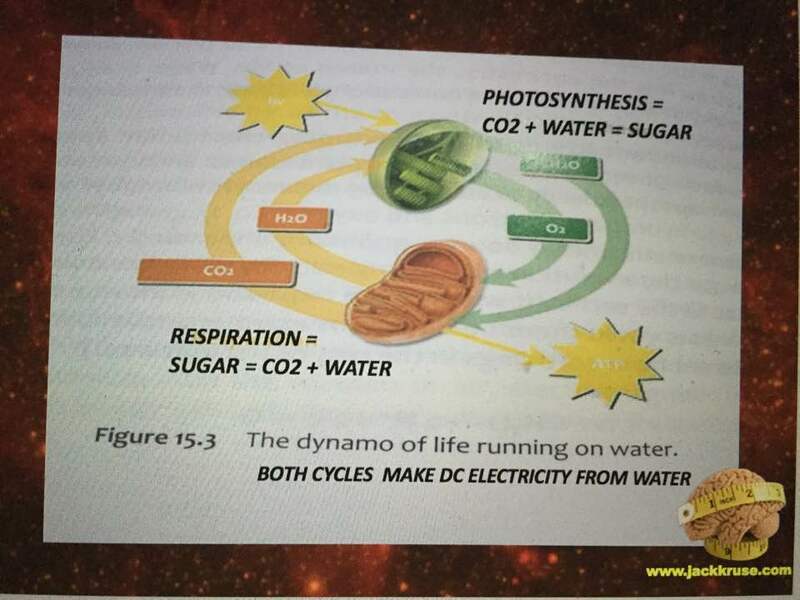 A high mitochondrial redox begins with a wireless connection to sunlight, while we are bound to the surface of Earth. High mitochondrial redox potential = a quiet nuclear genome. Low mitochondrial redox potential = increased ubiquitination and an active nuclear genome = Warburg shift in mitochondria = mitochondrial diseases. Glutamate dehydrogenase (GDH) is a key enzyme that links amino acid and carbohydrate metabolism in cells. Regulation is likely most important when organisms are confronted with extreme stresses such as the low environmental temperatures and lack of food associated with winter. This resident of the mitochondrial matrix catalyzes the NAD(P)(H)+-linked interconversion of L-glutamate to α-ketoglutarate and ammonium ion. Transamination is a catabolic pathway–for branched-chain-amino-acids like α-ketoglutarate. The branched-chain aminotransferase (BCAT) and branched-chain alpha-keto acid dehydrogenase (BCKD) complex have been determined to be in the mitochondria of human tissues. In the oxidative deamination direction in the Kreb’s cycle, GDH gates entry into the Krebs cycle by carbon skeletons derived from several amino acids (glutamate, glutamine, arginine, proline, histidine) and in the opposite direction is the first step in the synthesis of several amino acids. Furthermore, reversible transamination reactions involving glutamate are the primary way that amino groups are introduced onto carbon skeletons to synthesize amino acids and, oppositely, the primary way of deaminating most amino acids. This makes glutamate and GDH, that synthesizes it extremely important. The synthesis of both glutamate and glutamine are key steps in the cell metabolism in all organisms because they represent the only means of incorporating inorganic nitrogen into carbon backbones. Inorganic nitrogen is assimilated in the form of ammonium, which is incorporated as an amino group to glutamate or an amido group to glutamine. These amino acids in turn act as amino group donors for the synthesis of most nitrogen-containing compounds in the cell. In particular, the amino group of glutamate is used in the synthesis of purines, pyrimidines, amino sugars, histidine, tryptophan, asparagine, NAD+, and p-aminobenzoate. Therefore, glutamate is a key element in the nitrogen flow in all animals, as it plays a role of nitrogen donor and acceptor. Look at the nitrogen cage in the picture below. That is how critical they are to light collection from the sun. 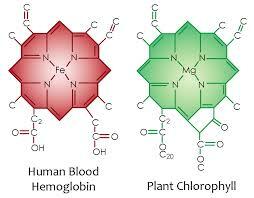 Chlorophyll and hemoglobin have the capacity to receive and emit UV light. Chlorophyll A absorption peaks at a wavelength of 430nm, and emits peaking at 662.669nm… hemoglobin absorption peaks at 308.01, and emits peaking at 345.18nm ending sharply at 600nm. In plants and microorganisms, the physiological roles of GDH include nitrogen assimilation, glutamate catabolism, but also osmotic balance (key to the EZ and CD’s in the EZ) and tolerance to high temperatures which are photosynthetic controls in plants and bacteria as well. In vertebrates, multiple biochemical pathways involve glutamate, which is also used as a neurotransmitter. The imbalance of the GDH activity by incident light frequencies lead to disturbances of clinical relevance for humans. Why do cancer researchers miss this effect? The answer: The majority of cancer research institutions around the world use yeast genetics as part of their research strategy. Yeast (Saccharomyces cerevisiae) and human split around a billion years ago and the light they are optimized under and is not equivalent to modern solar light. Cancer researchers have assumed that our sun has had the same solar spectrum for the entire 3.8 billion years life has lived under the sun. This series shows that our sun’s star class is well known to change in its mid-life. 600- 650 years ago the sun was mid-aged and there is substantial evidence solar spectrum changed. Cancer researchers use linear thinking that because yeast and humans have a common lineage, therefore, a plethora of cellular mechanisms have evolved in parallel. This assumption is quite bad. Why do I say that? The antenna system for this pathway is highly dependent on light from the sun. Read on. Free ammonia is highly toxic to organisms that excrete urea as the main nitrogenous waste such as mammals, fish, and adult amphibians, leading to inhibition of brain respiration and an excess ketone body formation from acetyl-CoA in the liver. The urea cycle is critical to detoxing ammonia. The TCA and urea cycles are linked by the enzyme fumerase. Fumerase adds water to both cycles. To prevent these deleterious effects, GDH and some of the other enzymes that yield amino groups into the urea cycle are localized in the mitochondria. 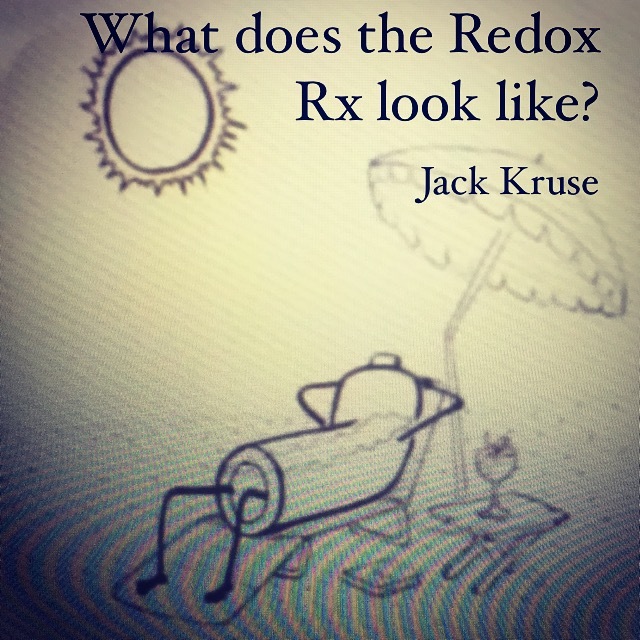 Mitochondrial redox potential is the key to detoxing these things. Pills and supplements do not help this situation. The key here is to realize that this function of glutamate may be disrupted in a mitochondrion that highly heteroplastic and has undergone a redox shift. This occurs because energy is lacking in the system. This raises the point, “what is mitochondrial heteroplasmy anyway?” Heteroplasmy links to the water layers adjacent and surrounding the MINOS layer surround the respiratory proteins to the TCA and urea cycles. So when that water is not structured to become an exclusion zone (EZ), the hydrogen bonding network is not tight enough in water’s networks around mitochondria. As a result, those networks are less condensed and more spread-out. This allows the proteins to spread out further than they should. Every one Angstrom of “stretching out” between the respiratory proteins leads to less electron tunneling and a massive loss of redox power in the mitochondria by a factor of ten!!! Why does this happen? Water has some anomalous properties when it is heated by IR-A light and life takes full advantage of these properties in a cell to improve energy flux in mitochondria. Liquid water can be supercooled below zero degrees C without freezing, but upon heating with IR-A light, the supercooled liquid does not expand like other liquids; instead it contracts to a maximum density at about 4 degrees C; this is very important for the hydrological cycle on Earth, as it plays a key role in rainwater percolating underground to refill the aquifers. It also depends upon the isotope fractions and halogen ions in water. It plays a bigger issue in cells because mitochondria create water as a side effect of oxidative phosphorylation. Mitochondria create water because they reverse the process of photosynthesis which consumes water. The creation of water inside a cell is how evolution brought the sea with a cell as complex life entered the land. This water creation is a huge issue because it forms the hydration shells around mitochondria and all proteins in the cell. It is this water, created by the mitochondria that contracts the distances between respiratory proteins increasing the tunneling speeds of electrons while creating massive pools of hydrogen protons to allow enzymes to be catalysts to speed reaction rates up millions of fold. In uncoupled mitochondrial haplotypes mitochondria create this light to activate the process, but in uncoupled Lo haplotypes around the equator, there is no need for this release because the sunlight is present 12 hours a day year round and always contains IR-A light from sunrise to sunset. They key is getting that sun exposure to make the process work. Sunlight contains 42% IR-A light. Our mitochondria are built around this chronic wireless connection. When the incident light a body senses is not sunlight and is another form of light, the result a decline in energy production in the mitochondria. This is called the Warburg redox shift. As a result, fat burning is lost, and a mitochondrion has to revert to older phylogenic pathways of glycolysis and glutamine catabolism for energy production. This is coupled to a mitochondria’s ancestry when it could use many other pathways for energy. In eukaryotes, because of mitochondrial gene deletion tied to endosymbiosis (only 37 genes), the choices are limited to two pathways to make energy. Where does the light come from for that tightens the MINOS water layer that houses the coherent domains in the EZ? All uncoupled mitochondrial haplotypes release IR light in the form of heat, and heat condenses water when it is confined in small spaces below 1.6 nm. The spaces in the cristae in the mitochondria, where the respiratory proteins exist, is one such space. You might remember, that water expands as it cools and not as it is heated by IR light at small scales. As more mitochondria become diseased in this way, we should expect glutamine and glucose utilization as Warburg observed. The shift occurs first with low oxygen tension and low NAD+. This mimics cells in our body that are obligate glycolytic cells like RBC’s. We won’t see a massive change in ROS and RNS signaling until oxygen tensions rise. We do not seem to realize these interactions in cells are present and change with incident light waves from varying sources to control the movement of electrons and protons in mitochondria. 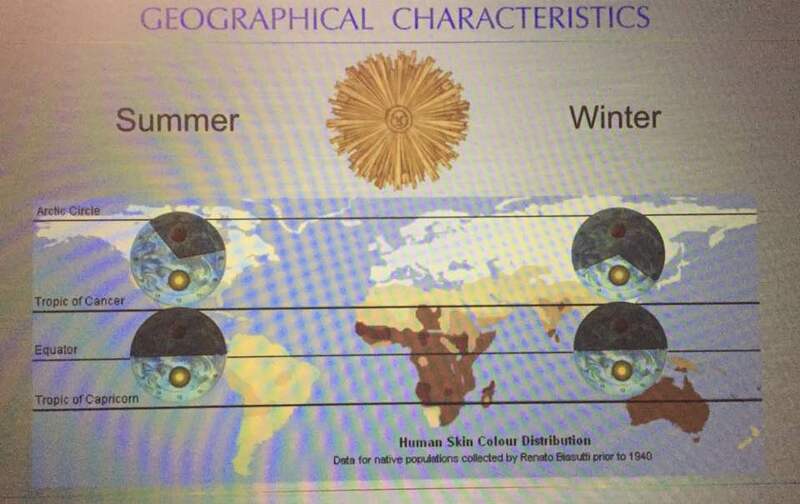 We are built this way because this is how humans left Africa to migrate to regions with different solar frequencies. The amount of oxygenation is related to the UV light exposure we face. What does the Sphinx tell us about ancient life? Did they know the power of the sun to heal via the skin and eye? It appears they built the Sphinx to face the sunrise in the East with all four extremities being on the ground simultaneously. It has a human face and animal body signifying all forms of life on land operate in similar fashion via the solar power. Life is based upon the entangled activity of photo-biochemical and photobiophysical processes mentioned above. Conventional medicine and physiology often tend to ignore the biophysical part of organic existence despite the fact that biochemical reactions without regulative and controlling information would end up in metabolical chaos. Biological processes notably seem to be able to suspend the laws of thermodynamics to some extent because of how a mitochondrion is built with water. Electromagnetic radiation created by the sun or within the living organism propagates in cell water and affects the biochemical pathways directly, thereby controlling and steering the reaction chains and their outcomes. Thermal management in mammals is anything but trivial since infrared-A radiation is not only the product of quantum energy degradation from photochemical processes down to heat but also the keeper of biochemical reproducibility and constancy of reaction kinetics. This is why the liver acts as an organ tied to the sun. In the liver, glutamate is the source of excess ammonium release, and the concentration of glutamate modulates the rate of ammonia detoxification into urea. In pancreatic β-cells (T2D link to heteroplasmy), the GDH is involved in insulin homeostasis, and oxidation of glutamate mediates amino acid-stimulated insulin secretion. This is why most studies on diabetics often show mitochondrial defects and are associated with other diseases of aging mitochondria. 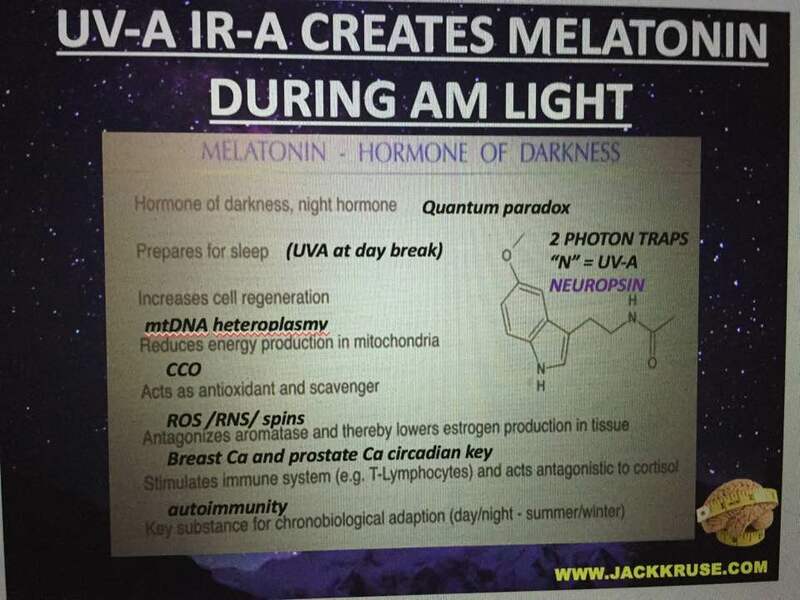 We are designed to clear out these bad mitochondria at night, under the power of melatonin but this ability is lost with circadian cycle mismatch because melatonin, dopamine, Vitamin A and vitamin D3 coupling is LOST. We do not seem to realize this link is bio-energic and mitochondrial based, and not strictly biochemical or genetic. Biophysics was the key to haplotype changes. In the central nervous system, glutamate serves as a neurotransmitter and also as the precursor of the inhibitory neurotransmitter γ-aminobutyric acid (GABA), as well as glutamine, a potential mediator of hyperammonemic neurotoxicity. Here we see how a low mitochondrial redox state links to neurodegeneration directly by way of a Warburg metabolism yet again. Why are we so obsessed with a nuclear genome etiology for cancer when all the evidence points to the loss of mitochondrial redox power? The key way to rebuild this redox power is via full spectrum sunlight to maximize the water production in the matrix. People forget that mitochondria reverse the photosynthetic reaction to make water in the cytosol and matrix. That water is special in many ways tied to biophysics. The clinical importance of glutamate metabolism in β-pancreatic cells (insulin) has been highlighted by the recent discovery of a dominantly expressed defect in glutamate metabolism, the hyperinsulinism/hypermmonemia syndrome (HHS). Might this be why diabetes is exploding in certain “zip codes” is appearing in thin people where RF/microwave radiation is brisk? Several GDH classifications have been done according to their size, oligomerization state, coenzyme specificity or organism, among others. According to their cofactor specificity, there are three basic types of GDH: those that are cofactor specific for NAD+ (EC 1.4.1.2), those that are specific for NADP+ (EC 1.4.1.4) and those that can use either cofactor (EC 1.4.1.3) (dual coenzyme-specific GDHs). Lower eukaryotes and prokaryotes usually have GDHs tat only function with one coenzyme whilst the enzymes that have dual coenzyme specificity are commonly found in higher eukaryotes like humans. NAD+ and NADPH are keys proteins in the Pentose phosphate pathway (PPP) I mentioned long ago in the EMF series in EMF 4 blog. The PPP becomes critical to the glutamine surge in disease states = to replace nitrogen in the carbon cage of cytochrome 1 where NAD+ is chronically low because of pseudohypoxia in the mitochondria. It does this by controlling the flow of protons in certain biochemical pathways. Most heteroplasmy rates are high because of low NAD+ as David Sinclair showed us in December of 2013 in his key paper on the topic. This means that diseases of aging and oncogenesis have to be a mitochondrial disease based upon where transamination and deamination occur. This is not what oncology and gerontology are teaching doctors in training. The other part of the Warburg hypothesis is linked to hyperglycemia. Hyperglycemia is exactly what Nora Volkow found in 2011 and what Allen Frey found in the 1960’s and 70’s when the brain was exposed to nnEMF. AMPk pathways are raised. They described this process in their papers. What neither of them did is link it to how protons recycle in pathways to be placed in DNA and RNA to work epigenetically with solar frequencies using topology. This is the basis of the epigenetic programs in humans. This is a biophysical process. Sinclair’s results showed us in diseases of aging low NAD+ and pseudohypoxia in the mitochondria of cells linked to a redox shift was the key change to aging and mitochondrial heteroplasmy. Why are we still looking in the nuclear genome for answers to diseases of aging, when it is clear the issue is in mitochondria??? WHERE DO TRANSAMINATION AND DEAMINATION OCCUR IN HUMANS? Aminotransferases catalyze the redistribution of nitrogen between amino acids and corresponding oxoacids participating in both protein metabolism and gluconeogenesis. They are ubiquitous in their cellular distribution. These pathways are critical for proton recycle in cells. For example, tissue activity for AST (aspartate aminotransferase) is as follows in decreasing concentration: heart, liver, skeletal muscle, kidney, pancreas, spleen, lung, and erythrocyte. Two distinct forms have been identified: a cytoplasmic, or soluble isoenzyme, and a mitochondrial isoform. The distribution and relative tissue concentration of ALT (alanine aminotransferase) are similar but importantly different. The highest activity is found in the liver, followed by kidney, myocardium, skeletal muscle, pancreas, spleen, lung, and erythrocyte. ALT activity is found in the cytosol; organ- or organelle-specific isoenzymes have not been demonstrated. The concentration of ALT in hepatic cell cytoplasm is comparable to AST; however, a mitochondrial ALT isoform is not found. In all other tissues, ALT activity is significantly less than AST. As regards deamination, performed by glutaminase, there are many papers which indicates that it is found in the mitochondria of a variety of tissues. There are two isoforms, one especially active in the kidney, and the other in liver (although both are found in other tissues). Again……if deamination is disrupted in disease states why are we still looking in the nuclear genome for answers to the deepest problems in health care now? The oxidative deamination takes place inside the mitochondrion because the glutamate dehydrogenase is localized in the mitochondria. Transamination also occurs inside the mitochondria with a small component in the cytoplasm. Glutamine is synthesized primarily in skeletal muscle, lungs, and adipose tissue. Plasma glutamine plays an important role as a carrier of nitrogen, carbon, and energy between organs and is used for hepatic urea synthesis, for renal ammoniagenesis, for gluconeogenesis in both liver and kidney, and as a major respiratory fuel for many cells. The catabolism of glutamine is initiated by either of two isoforms of the mitochondrial glutaminase. Liver-type glutaminase is expressed only in periportal hepatocytes of the post-natal liver, where it effectively couples ammonia production with urea synthesis. Kidney­ type glutaminase is abundant in kidney, brain, intestine, fetal liver, lymphocytes, and transformed cells, where the resulting ammonia is released without further metabolism. The two isoenzymes have different structural and kinetic properties that contribute to their function and short-term regulation. The fractionation of hydrogen isotopes here have a massive effect on their physiologic abilities. Although there is a high degree of identity in amino acid sequences, the two glutaminases are the products of different but related genes. The two isoenzymes are also subject to long-term regulation. Hepatic glutaminase is increased during starvation, diabetes, and feeding a high-protein diet, whereas kidney-type glutaminase is increased only in the kidney in response to metabolic acidosis tied to pH changes. Here again, you see the link to protons. The adaptations in hepatic glutaminase are mediated by changes in the rate of transcription, whereas kidney-type glutaminase is regulated at a post-transcriptional level. This also points to a mitochondrial etiology. YEAST AND HUMANS ARE NOT EQUIVALENT CANCER RESEARCHERS!!!!! Mammalian GDH’s represent a clear deviation from its ancestral forms, since they have the so-called light antenna, a 48 amino acid insertion near the carboxy terminus, although it is not clear when this feature first evolved. The largest structural difference between mammalian and bacterial GDH is the light antenna on the molecule which has a helix-loop-helix conformation. Light is designed to hit the protein and the electromagnetic wave is changed to an electro-mechanical vibration in the hydration shell of the protein. That electro-mechanical wave created by these collision effects things suspended in the cytosol. A mitochondrion is swimming in this “sea of water” it creates. That water has key biophysical features water in the ocean does not share. 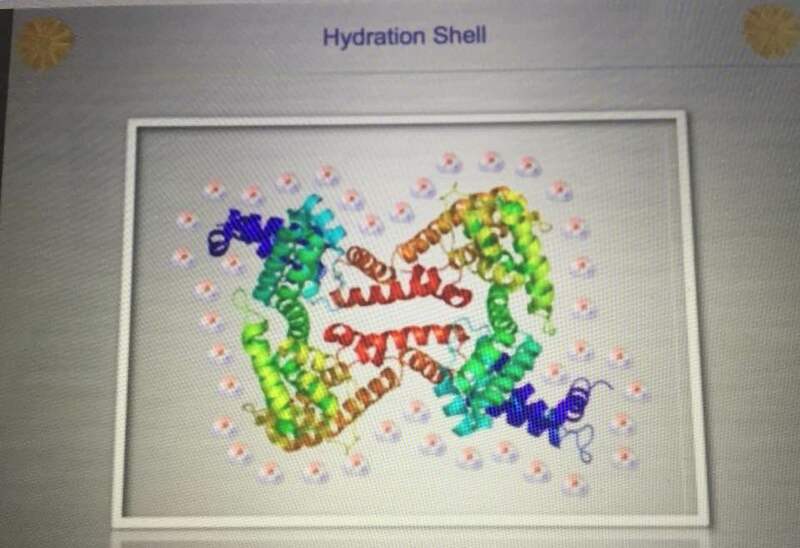 Water inside a cell accepts this transduced light signal to make sense of the energy and information in light vibration that hits the protein. The size and shape of the protein are key to the right oscillation being generated. The light antenna ascends from the NAD+-binding domain surface via a long, 23-residue helix and then descends back to a random coil structure. The helices of the “antenna” domains in each subunit of the trimer wrap around each other with a right-handed twist to form the core of the antenna protrusion. Extensive contacts between “antenna” may represent hexamer interactions in solution and, perhaps, with other enzymes within the mitochondrial matrix. The fact that antenna is only found in the forms of GDH that are allosterically regulated by numerous ligands leads to the interpretation that it plays a major part in this regulation. That light antenna can be changed by the type of protons it contains. In contrast to the extensive allosteric homotropic and heterotropic regulation observed in mammalian GDH (see below), bacterial forms of GDH are relatively un-regulated in a similar fashion. In brief, GTP and ATP are allosteric inhibitors whereas GDP and ADP are allosteric activators of GDH. Now consider that nnEMF and blue light increase GDP and ADP. Red light (IR-A specifically) raises ATP and GTP levels. The type of light you surround your tissues with, alone on your surfaces, can start this process or slow the process of a Warburg metabolism. Hence, a lowering of the energy charge accelerates the oxidation of amino acids and this points out why Fritz Popp found diseased and cancer cells lost massive amounts of light while glutamine was shuttled like an addiction to the mitochondria. When amino acids become oxidized they change their shape and size and this changes the vibrations they make with sunlight and in cell water. Heat and cold stress can raise heat shock proteins like HIF-1 and HSP-70 which act to stabilize the 3D structure of oxidized proteins to a degree. Once that threshold is passed, a serious redox shift in mitochondria is inevitable. The intracellular compartmentalization of the cofactors and the GDH itself may also drive the reaction in one or the other direction. In vertebrate cells, GDH appears to be localized primarily in the mitochondrial matrix just where a mitochondriac would have guessed it was. When heteroplasmy rates rise mitochondria cannot burn fat so glucose and glutamine are their only choices. This works well for bacteria, but not bacteria that have been forced to become mitochondria in eukaryotic cells because they have lost their metabolic flexibility due to mitochondrial gene deletion caused by endosymbiosis. We need to compare this situation to other prokaryotes (bacteria) who have multiple options for fuel sources and terminal electron acceptors available to use when the environment changes dramatically. This is why bacteria, archaea, and mold/fungi respond briskly to changes in electromagnetic fields and nutrient density. They are highly flexible and redox shifted their metabolisms to meet energy demand dynamically. We fail to realize that mitochondrial ancestry is bacterial and they respond in similar fashion, but they have had their flexibility limited to glucose and glutamine in eukaryotes. The deletion of mitochondrial genes and loss of thermodynamic information seems to be why this situation exists in a Warburg shift in humans. When the environmental signal changes, it is sensed by the mitochondria to change energy flux in a cell. This can be from incident EMF’s or from oxygen levels. These are the key things that mitochondrial use proximally and distally in ECT. When the environmental stimulus is chronic and sustained, it tends to force a redox shift that can only use glucose or glutamine when nnEMF, low NAD+ or pseudohypoxia exists. This chronic environmental stimulus leads to a new response in the mitochondria. Mitochondrial energy flux changes nuclear signaling so that an “immortality” or pro-growth response is made. This response blocks apoptosis and mitophagy in mitochondria and we get a clonal expansion of poorly functioning mitochondria in a tissue. Because of the gene deletion in mitochondrial DNA, it is the only choice a mitochondrion has in this situation and when redox power is decreased chronically and will lead to a disease phenotype that manifests solely from the loss of energy production from the defective mitochondria. This is the basis of Dr. Doug Wallace’s work for the last 40 years. If this “brown out” energy loss process becomes chronic in the mitochondrion, cancer is the eventual reality, because a low redox state activates nuclear expression. Cancer is a mitochondrial disease and Warburg’s effect and glutamine metabolism prove it when you view it from the “energy perspective” and not the genomic perspective. This is why the nuclear genome focus in cancer research is very narrow and myopic. The use of yeast modeling also has allowed for major gaffs in logic to develop in the published literature since 1970. This light antenna is a big deal to the quantum clinician with a different perspective. It is not present in yeast, plants, and photosynthetic bacteria, but it is present in things with mitochondria. WHY? Light travels via a twisting spiral because its electric field is always orthogonal (90 degrees) to the magnetic field in an electromagnetic wave. This means as light travels toward any object and interacts in any media it spirals. 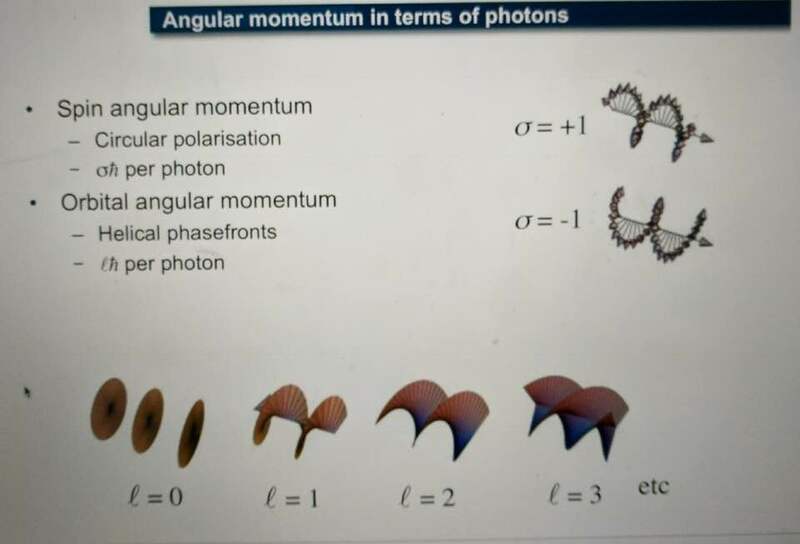 Light has an angular momentum because of this spin. And in humans, it tends to spiral clockwise and this is why are tissues have a chirality to them. People and scientists just looking for direct biochemical connections of GDH in a Warburg metabolism are not wise. Why? Molecular resonance is how these pathways operate as semiconductive pathways between the surface of the eye and skin and the rest of the body. This is why mammalian GDH has a helical antenna unique to our species. That protein uses protons to make the difference in redox transfer to our proteins. Its protein is a “light antenna” for specific incident light frequencies and protons that turn it on and off. Blue light has the energy to turn it on and UVA and IR-A turn it off based on how electrons and protons are controlled. Many other parts of the spectrum have varying effects on GDH leading to many dynamic states of dysregulation. 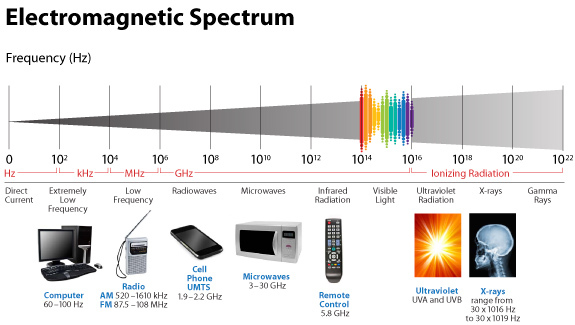 The electromagnetic spectrum of light is very large and variable and this is why nnEMF can have so many non-linear effects in cells. Eukaryotic cells work best from 0-200Hz and within the visible spectrum of sunlight. Today’s world is much different than Earth’s native EMF action fields. Look at the pictures carefully. This means light via the eye and skin directs and affects targeting anywhere GDH is present. 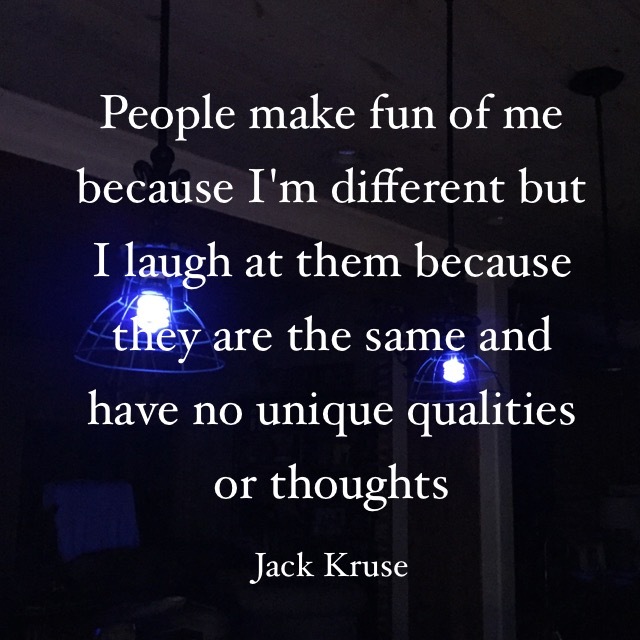 No matter if it is in the gut or kidney and the connection does not have to be directly made; it can be indirect using molecular resonance using light optically and magnetically by way of the Faraday effect. That is why the first cytochrome in mitochondria is a fluorophore protein and absorbs light at 340nm at the (NAD+/NADH couple). Why would nature put a UV protein deep inside of us, on the inside of the mitochondrial membrane is where NAD+/NADH couple resides? Note the depth of penetration of UV. This is a fluorophore-protein, but we all know UV light cannot penetrate our surfaces well, so how does this light get there? 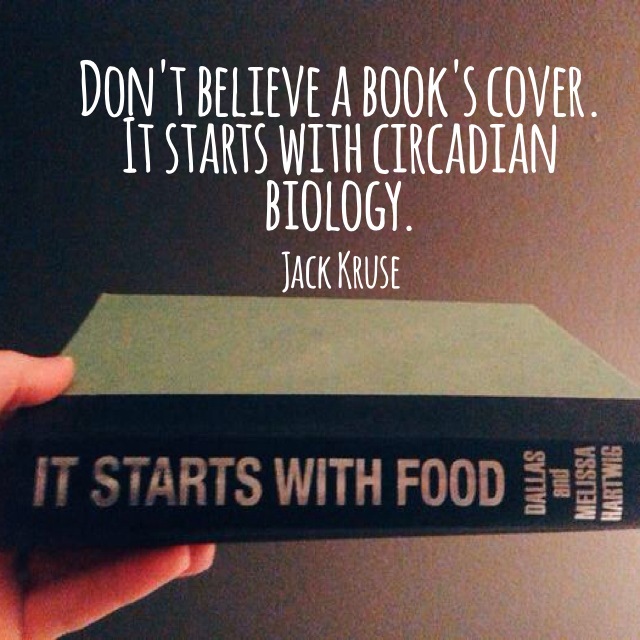 It gets there from food electrons. It also gets there from the bio-photon field at night. When we eat food becomes excited electrons and protons. Those electrons are excited by sunlight via photosynthesis. Protons gain redox via their spin numbers. Electrons are always delivered non-stop to the inner mitochondrial membrane to enter ECT when we eat. But is there a caveat to this normal situation? Yes. In direct sunlight, we do not need food electrons to make ATP. In fact, this is how apoptosis is controlled in sunlight to limit cancer risk. Cancer cells inactivate apoptosis to remain immortal. When UVA and IR light are hitting the skin and eyes, redox is rising, apoptosis is useful, and we do not need as much food. IRA light can spin the ATPase and affect the cytochrome 4 (COX) which has 4 red light chromophores in it that control the mechanisms of apoptosis. But when we do not eat and we are in sunlight with UV-A light and IR-A light ECT flow from the NAD+/NADH cytochrome is slowed down to cytochrome 4 but highly powered electrons are entering cytochrome c oxidase. Why? 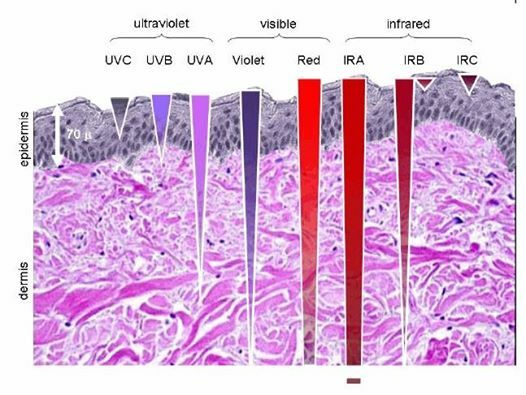 UV-A light in the eye and skin makes nitric oxide (NO) in the skin and enters the bloodstream to inhibit cytochrome C oxidase tunneling while red light keeps moving H+ through the ATPase while oxygen levels are decreased. They are decreased because they are linked to ECT flow speed. Without electrons to reduce electrons not as much oxygen is needed. The IR-A light activates the ATPase to act a perfect quantum nanomachine turbine to make 2/3 of the ATP a cell needs to operate with NO input from excited food electrons. UV light, by itself, raises venous oxygen saturation. Cancer cells operate with inhibited apoptosis and are much more likely when people are not in the sun. This is why I always tell people sunlight is nature’s cancer vaccine. Understanding how sunlight works the inner mitochondrial membrane is the key to understand why a lack of solar light requires more food to feed the ECT to flow to oxygen. Light gets there on the backs of electrons from food, and from protons indirectly, by way of the sun. This is how excitons work in chloroplasts. It appears it may be how light works in a mitochondrion too. Basically, most of the biological studies are looking for either direct neurological innervation or for neuro-endocrine secretion as the mediators of SCN outflow of circadian information control. We know ubiquitin controls carbon and nitrogen flow in us. We also have firs proof that ubiquitin is tightly coupled to the circadian G-box control proteins. What’s the moral of this story in any tissues mitochondria and its connection to the retina/SCN/leptin pathway?? 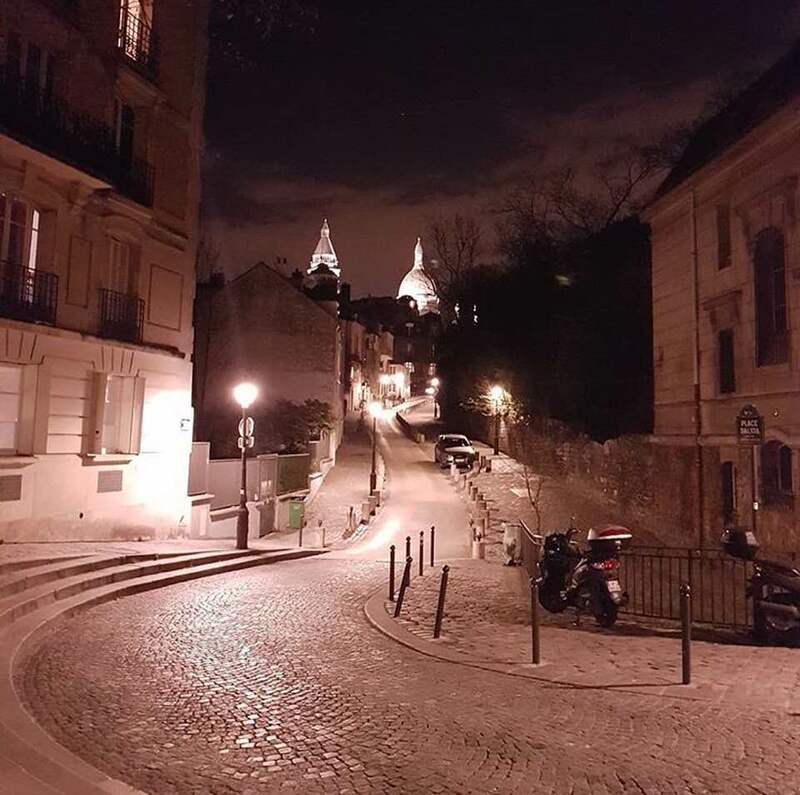 You can’t find what you are not looking for, can you? If the key mediators are indeed vibrational energy waves contained in light and the spin of electrons and protons. Nobody knows about these factors because they are biophysical and not biochemical or genetic. A good example of the limitations that the scientific paradigm (current biologic dogma) always impose upon experimental research. Science is NEVER independent of its epistemological framework. Thinking that it is or can be is one of the most important errors of our era and when it comes to quantum biology it is. This why pathway biochemistry mentioned above by Warburg has never been solved. WNo one has solved why Warburg’s observations are what they are. I have an idea of exactly how it happens and will give that in my May 2018 webinar. Oncologic perspectives have been built by biochemical ideas that are devoid of the biophysical mechanisms. This is why their ideas are a dead end for disease reversal because they do not understand how light and the helical antenna of GDH work together. What brings light or information to GDH? Excited electrons and H+ from food and from hemoglobin. Might this be why RBC’s have no mitochondria? What happens on the surface of the skin, blood, gut, lung, with respect to light, directs the biochemical pathways below. Outside in is critical, not inside out. A genomic perspective keeps you thinking look inside the genome and not outside to the environment to understand how mitochondria react to it. This is where science is leading us; it is not back to a biochemistry book with ideas that are static and not dynamic.” Anyone who espouses bio-chemical solutions to me announces to me they have old ideas divorced from the physics of organism. The helix on GDC is a big clue it is an electromagnetic antenna for light activation or deactivation depending upon the frequency of the incident light wave. When mitochondria are stressed calcium comes rushing into it. Why? It is trying to re-tune the inner mitochondrial membrane to oscillate at 100Hz so it can return to fat burning. When it cannot, mitochondrial stress increases, its size increases, and heteroplasmy rates rise. 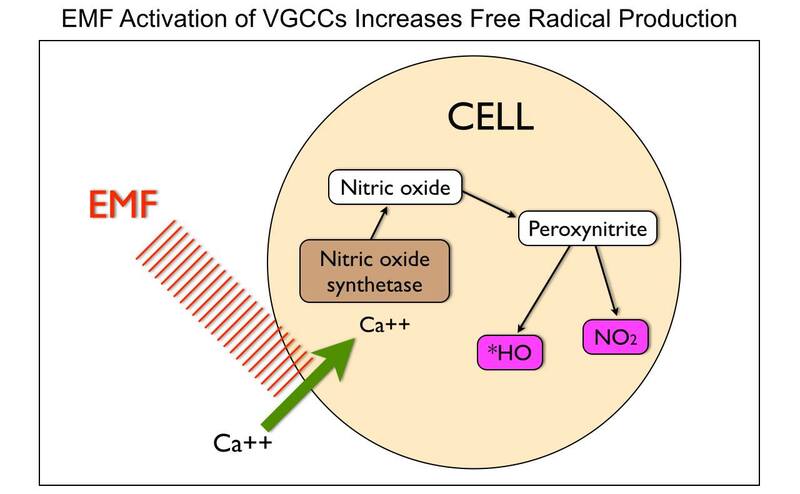 The influx of mitochondrial calcium increases the rate of oxygen consumption to create a relative pseudohypoxia at the tissue level because of the activation of calcium-activated dehydrogenases (GDH mentioned above), and by activating mitochondrial nitric oxide synthase (mtNOS), decreases the rates of oxygen consumption because nitric oxide is a competitive inhibitor of cytochrome oxidase. Could it be science has missed the key of Warburg’s findings because they do not consider the action of light on the antenna of GDH? An alternative quantum mechanism might be proposed considering that during a transient rise of cytosolic calcium, the mitochondrial calcium increases at a slower rate, but stays elevated longer than the cytosolic one and, thus allowing the activation of dehydrogenases other than α-ketoglutarate dehydrogenase when a light is not present for molecular resonance from the mitochondria? Popp showed definitively cancer cells leak massive amounts of light in humans. Interesting huh? I got these ideas from the last two cites below. Cells need mechanisms that ensure that the rate of formation of ATP matches tissue requirements for this molecule. In most mammalian cells, ATP is mainly formed through mitochondrial oxidative phosphorylation. 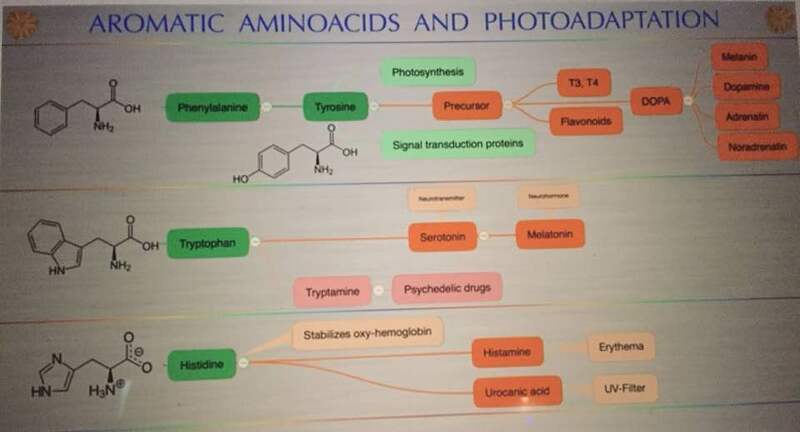 Changes in ATP synthesis (ATPase) can be completed through alterations in the activities of the mitochondrial dehydrogenases (IR-A red light does this! ), which generate NADH and FADH for the respiratory chain. People do not realize IR-A light can replenish these things with no FOOD intake needed. Three of these dehydrogenases are of particular importance (i.e., pyruvate dehydrogenase, NAD+-dependent isocitrate dehydrogenase, and 2-oxoglutarate dehydrogenase) because they can be activated by increases in calcium, (NAD+)/(NADH) or (ADP)/(ATP) ratios. nnEMF is well known to cause calcium imbalance in cells, especially mitochondria. The picture below shows this occurs. This would alter their ability to control mitochondrial energy dynamics at the respiratory chain level (subatomic). For those interested in knowing their NAD+/NADH ratio, you can easily infer so from basic labs that measure pyruvate, lactate, and pH. All these things link to protons. For those interested, the paper in Cite 1 also provides an insight into elevated NAD+/NADH redox in prostate cancer cells. Calcium, among its many biological functions, is an essential metabolic regulator that can lead to massive amplification of ROS that increases heteroplasmy. It turns out electromagnetic fields are fully capable of disrupting this ability in living things. We do not need any nuclear DNA change apriori for this to happen!!!! Anyone who calls for nuclear change in genes from nnEMF makes their ignorance knew to the audience they are speaking too. Today that audience is the public. They are being kept docile by military and government scientists whose tabs are paid by THE PUBLIC via taxes. You have to educate yourself because the paradigm is not going to do it for you. Bankers on Wall St. won’t allow it. Calcium flux can stimulates glycogen breakdown, it triggers muscle contraction and mediates many hormonal signals as a second messenger. Calcium also plays an important role in the regulation of the citric acid cycle by activating pyruvate dehydrogenase, NAD+-dependent isocitrate dehydrogenase, and 2-oxoglutarate dehydrogenase, thus allowing the same signal that stimulates muscle contraction to activate the production of ATP to sustain it in mitochondria. Hence, calcium flows are linked and coupled to many feedback mechanisms, oxygen consumption, NADH reoxidation, and ATP production are tightly coupled to coordinate its NADH production with energy expenditure. Calcium also is tied to evoked potentials on EEG’s in the brain. This can alter neurotransmitter release. nnEMF can do this to any cell without any nuclear DNA activation. A falling NAD+ and pseudohypoxia are what makes up the Warburg mechanism in all mitochondrial diseases but what causes it is a falling mitochondrial redox shift. Why are we still looking into the nuclear genome for the answer? Never waste your time trying to explain your ideas who you are to those committed to misunderstanding your perspectives about science. In fact, a dumb man’s/practitioner’s report of what a smart man says can never be fully accurate, because that person unconsciously translates what they hear into something only they can comprehend. They have no clue what they are missing and they are misleading many off a cliff. My promise to you is this: With time it will be proven surface chemistry interaction with incident light waves with the tissues of the skin, eye, lung, and gut is more important than biochemistry pathways printed in books for humans. Right now nnEMF is making 80% of all 20th and 21st-century diseases new mitochondrial diseases and that is driving the S&P 500 and the global economy. Most of the diseases I teach people about are linked to this mechanism and most clinicians do not realize it because they do not understand physics of organisms. For the economy to be “healthy”, America has to remain unhealthy, because technology is driving both sides of the equation today. This is our inconvenient truth. Most scientists and people do not see it this way, but I do. It’s obvious when you understand mitochondria and what Warburg really found in 1924. The implications are immense for mankind. We are looking into the nuclear genome for a solution to a mitochondrial problem. This is why the healthcare paradigm cannot solve the chronic disease conundrum of modern man. The first light bulb showed up in 1879 right when modern diseases linked to mitochondrial function manifested in reality. These diseases seemingly came out of the blue, literally and figuratively. In 1879, cancer, Alzheimer’s, and autoimmunity were exceedingly rare conditions and now they are ubiquitous in 5 generations time. Moreover, now we autism, diabetes, AMD, myopia, and obesity exploding and no one has a good answer for any of them. The reason is simple. We do not yet understand how mitochondrial energy and information flows quiet the genome. Did you know Chicago was electrified in 1893 at the World’s Fair by Tesla and Westinghouse? Paris was fully electrified and lit by bulbs at night in 1924 (pic above). This is barely a 100 years ago. This is why the system of science is broken today. The few in power (NIH), pay for the science they want to be done, not the science we need to be done to solve chronic illness. Mitochondrial medicine will force us to look outside of the nuclear genome and into the environment for the real cause of disease and stop looking inside of our genome for all the answers to cancer. The nuclear genome bias of the 20th century has forced us to look with tunnel vision inside of our cells, and this is why we’ve ignored the environment’s effects on mitochondrial energy generation mechanisms. It has cause mankind a global foundational incongruity in scientific exploration and that incongruity will keep science blind to the real etiology of man’s current problems until we all do something about it. Calcium and the regulation of intramitochondrial dehydrogenases, Methods Toxicol., 2 (1993), pp. 390–403.